I have to admit I have been sitting on these guys for a while now, but I finally got a chance to clip some new heads for my Cataphractii. Now off to wash them and get some paint on them. Well, once I'd built the Tactical Sergeant, I couldn't very well have stopped there. Eight (8) is the number of Khorne .. so I rounded out the squad, just like the Rampagers. This group comprised some B@C Maximus legs and arms, Chaos Beserker torsos and some Forgeworld Seeker Bolt-guns. 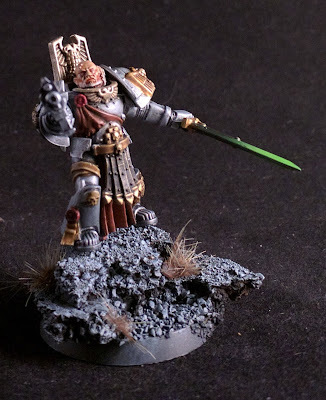 I found some more time to work on a Tactical Squad Sergeant, for the World Eaters. (Apologies for the blurriness of the pictures). 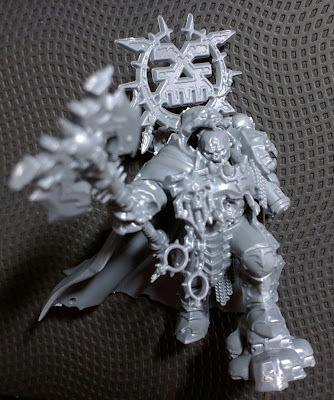 The lower half and head is from an AoS: Wrathmonger. 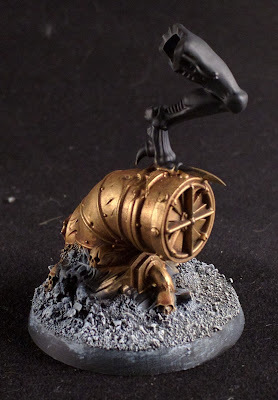 Chest and Bolt-gun from a Chaos Beserker. Axe and vambrace from a Skullreaper. 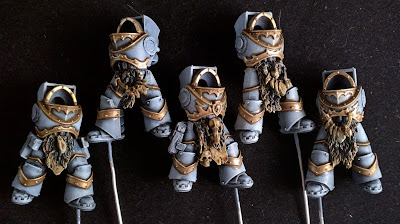 I also reused the backpack from the Chaos Marine Aspiring Champion. So what do you do when Plan-A goes astray? 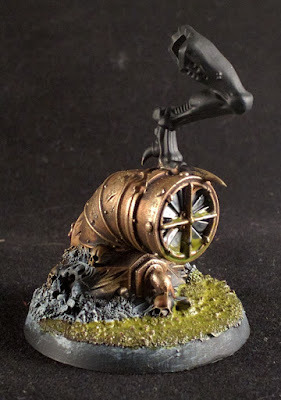 For example, the liquid effect on the base of the Genestealer Patriarch. Unfortunately that "ring" mark around the edge just doesn't seem to want to come good. Below is what it looked like after 3 days of trying to cover over the "ring". Unfortunately, this just didn't meet the cut. So I switched things up, and cut out a portion of the base and rebuilt an new false base. So the idea is to paint inside the base then pour the liquid effects inside. Here is what the underside looks like. I had to make it a little water tight for when I pour in the liquid effects. So the first attempt on the water effects had mixed results. You can see that it formed a small lip where the tape was. So while I was thinking about how to fix this up, I added some GW Technical Nihilakh Oxide into the ridges of the pipe. In the end I topped up the ring with more Water Effects. Now I just have to wait for it to dry, so I can then come back to trim and clean up the rim. Been busy doing some landscaping about the house, but I did manage to get some time in, between meetings and appointments to continue building some World Eater Rampagers. 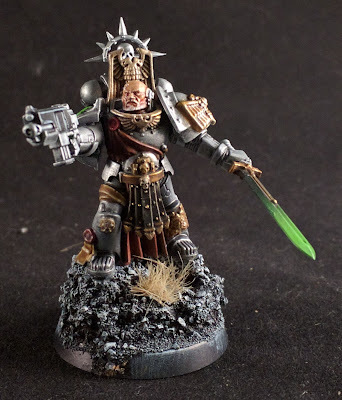 First, I will start with this squad's Sergeant. Initially I posed this fella to be jumping down on some poor soul's head. I might still do it. Just have to build an appropriate base. Next up are the rank and file. But I just want to show you a little of the process I go through, when building these blood-thirsty mad men. 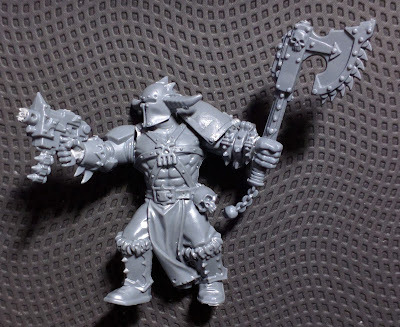 Initially you have an AoS miniature, and you cut the shoulder off, add a chain weapon to bring it into the 30k universe. The only issue with this is that it just doesn't quite have that sci-fi fantasy feel, yet. A quick snip and addition of a Chaos Raptor bolt-pistol, et voila. 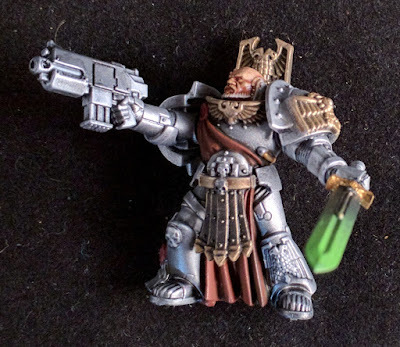 Psychotic post-Istvaan World Bearer Rampager, wielding Chain close combat weapon and bolt pistol. Progress continues on the base for the Patriarch. 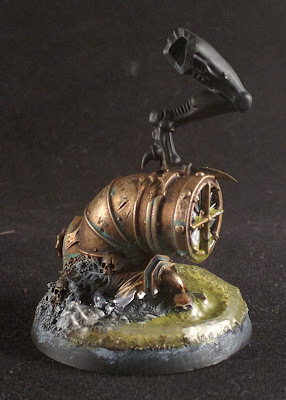 I added some GW Technical Paint Nurgle's Rot to the pipe and put down a layer on the base, to emulate a puddle. I then went back and taped off the base, adding Secret Weapon Water Effects over this layer to give it a three-dimensional feeling. I will let you know how this one turned out, when it dries. Almost done. Not much left except for cleaning up the cloak. Hopefully will be finished soon. So I heard once that a good artist knows when to finish an artwork. Well I guess I am either a dodgy artist or a pure hobbyist. My Knight Errant is finished, for the time being. I guess all that is left is to clean up the base edge and maybe add a highlight to the sword edge. You see, I am a hobbyist, just can't leave things alone. 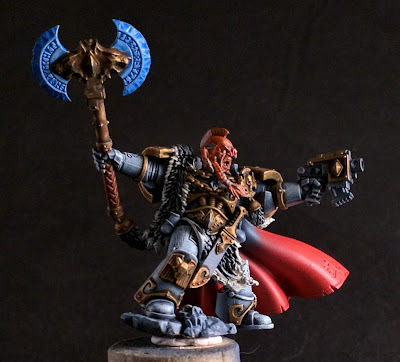 Progress on Ulrik. He's almost finished. Just have to finish his pistol arm, eyes, gold on the banner pole, handle on the Crozius and final blending on the cloak, near to the fur. Hopefully finish this one by the next article. 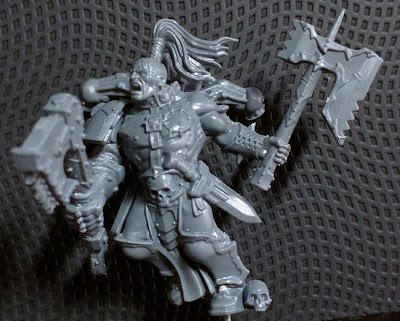 So whilst I was lamenting over my conversion woes, I dug out some AoS miniatures and took a good look at whether I could adapt them to 30k, either as cultists or Marines post-Istvaan. Given the amount of armor on these miniatures, or lack of, I was going to simply turn them into a cultist detachment. 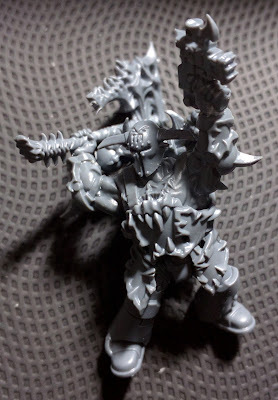 But looking at them more, I came to the conclusion, that I would use them for a small World Eaters Rampager/Khorne Beserker Unit. Below was my test. 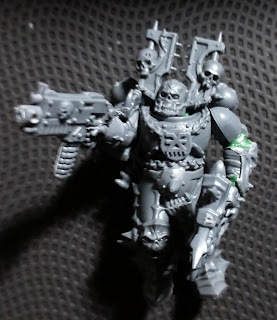 Adding a 40k Khorne backpack and Beserker Chain axe arm and Shoulder pad, bolt pistol on his hip. Maybe I will pop a helmet, mag-locked, to his belt, but really I likethe dynamic crazed feeling that this guy has. A real "I don't need no stinking armor, because I am going to bury my axe in your forehead," kind of vibe. So I was sitting around staring at my Dreadnought kit-bash, half admiring it and half hating it. It was while I was pondering why I had fallen out of love with the conversion, when I came to the realization as to why. Was it the time taken to make it? Nope. Was it the time it took to paint it? Nope. Does it look like crap? Not really. I came to the conclusion that it is the size of the conversion. General Ramblings #23 - Shout-out to Age of Darkness Podcast! Just wanted to make a big shout out to Age of Darkness Podcast! 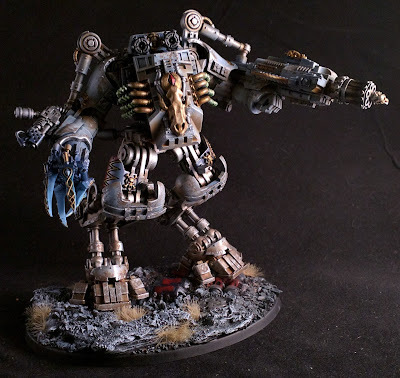 They were nice enough to call out one of my grey paint recipes for the Vlka Fenryka. I posted back on March 5, mentioning their podcast. 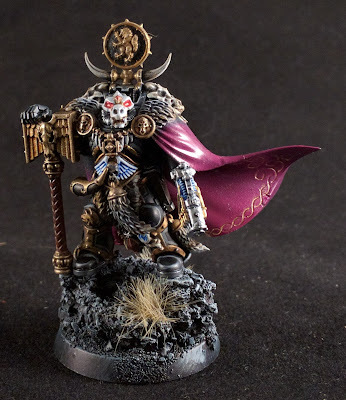 I also still maintain they put on one of the best Heresy podcasts out there. A little more politically correct than the Eye of Horus, and more irreverent than the Imperial Truth. Their box of shame and JP's constant warming of it, is a highlight. And for the rest of you folks, I recommend you download them on iTunes and give them a five (5) star rating and review. 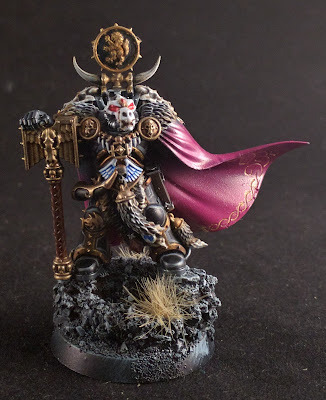 My incarnation of Bjorn was looking a little too clean, so I started adding some weather effects to him. It has been so long since I did the drop pod, I almost forgot how to do it. Long story short, this is how it turned out. As you can see the legs, feet, shoulders and arms are fairly heavily chipped and scuffed now. there is a bunch of oil staining added to the mix. To be honest I think this is about as far as I will go with this fellow. 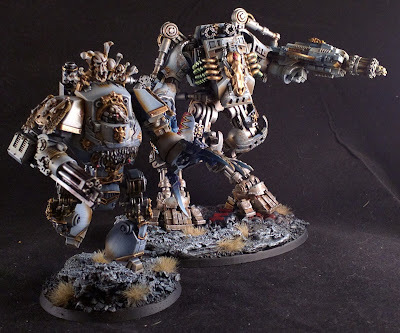 He's been a great journey, fun project to tick off the list, but I am liking my Contemptor conversion over this one. Almost complete on my Knight Errant. Just some minor details left, like the laurel on the right shoulder pad and I have to finish his backpack, which was ready, but I decided to add an Iron Halo to it, to fit the rules. Should be finished next time I post about him. Work continues on Krom. Still a few things to clean up on this one. I am actually using him as a reward after toiling on batch troops, so sorry it is taking so long. Progress continues on the Fenrisian Wolves. Just a couple close up, but you get the idea. Still have to get in and finish the mouths and eyes. I am thinking the they are maybe a little too grey, but then again, I want them to camouflage into the snow and rock of a Fenrisian landscape. Progress continues. The Cataphractii are complete except for their heads. Currently working on painting all the magnetized weapon options. My Knight Errant is nearing completion. Just a few pieces to tidy up. Not long now, more to come. 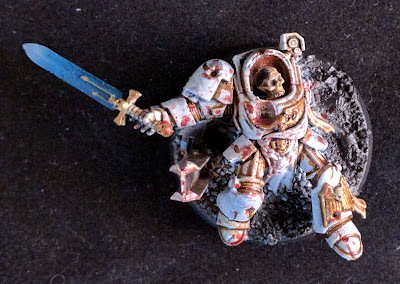 Finally added the skull to this miniature. Darkened of the base surrounding, so there was less of a white "halo" from the over air-brushing. Next up will be the drybrushing of the base texture and adding some tufts. 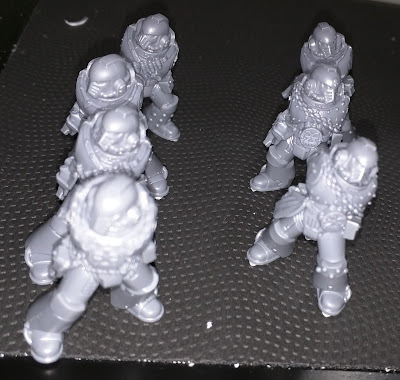 Progress continues on the Cataphractii Terminators. So I used the usual recipe on the Cataphractii. Vallejo Polyurethane Dark German Grey primer, Vallejo Model Color Pale Bluegrey, Blacklining wash, then first highlight Vallejo Game Air Wolf Grey and final highlight of Vallejo Game Air Ghost Grey. I also started the furs and bone fetishes, with Vallejo Game Air Bleached Bone. The golden areas are also the usual recipe, Vallejo Game Color Brass, shaded with Vallejo Game Ink Sepia, first highlight drybrush of Vallejo Game Color Brass.